Copyright 2013 The Authors. Journal of Geophysical Research: Oceans published by Wiley on behalf of the American Geophysical Union. Underway and in situ observations of surface ocean pCO2, combined with satellite data, were used to develop pCO2 regional algorithms to analyze the seasonal and interannual variability of surface ocean pCO2 and sea-air CO2 flux for five physically and biologically distinct regions of the eastern North American continental shelf: the South Atlantic Bight (SAB), the Mid-Atlantic Bight (MAB), the Gulf of Maine (GoM), Nantucket Shoals and Georges Bank (NS+GB), and the Scotian Shelf (SS). Temperature and dissolved inorganic carbon variability are the most influential factors driving the seasonality of pCO2. Estimates of the sea-air CO2 flux were derived from the available pCO2 data, as well as from the pCO2 reconstructed by the algorithm. Two different gas exchange parameterizations were used. The SS, GB+NS, MAB, and SAB regions are net sinks of atmospheric CO2 while the GoM is a weak source. The estimates vary depending on the use of surface ocean pCO2 from the data or algorithm, as well as with the use of the two different gas exchange parameterizations. Most of the regional estimates are in general agreement with previous studies when the range of uncertainty and interannual variability are taken into account. 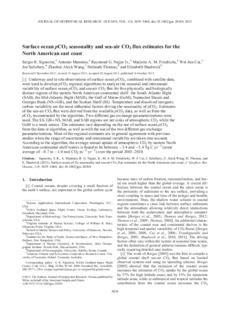 According to the algorithm, the average annual uptake of atmospheric CO2 by eastern North American continental shelf waters is found to be between −3.4 and −5.4 Tg C yr−1 (areal average of −0.7 to −1.0 mol CO2 m−2 yr−1) over the period 2003–2010.